This test is accomplished and funded by LP:s biodling bee equipement supplier, Arne Andersson sideline beekeeper and Erik Österlund sideline beekeeper. Therefore we decided to maximize the number of hives for the two main groups in this test to 10 hives (5+5). We also decided to make two or three alcohol washes with 1 dl of bees to monitor the varroa level during the season. When the Varroa level was higher than 3% we planned to treat with thymol. If it appeared wingless bees in or in front of a hive treatment was also to be performed. If possible a harvest should be taken and sugar solution (or honey) fed at the end of season after harvest to ensure enough food for winter. The goal should be to leave a fair amount of honey for winter, if possible as much as you think your bees have got genetics to make it through the length of your winters. Increase are made by making so called walk away splits that remain in the same apiary as the mother colony. These are allowed make there own queens, or supplied with mature queen cells made from a good colony in the apiary. This should also be the swarm prevention method. We choose to use two different types of bees in the project. One type that has been selected for varroa resistance during many years, Elgon, that has been bred with this purpose since 1989. Another type that hasn’t been selected less, but in other traits are good, pure bred Carnica/Carniolan bees. The number of colonies wintered each autumn would be a way to measure the difference in success between the two parts (large and small cell size) of each main group, Elgons and Carniolans. To be counted in the increase would be the colonies that are brought out from the apiaries and the project, a kind of crop. What we measure will thus be the production of new colonies and survival of colonies to the next season, the difference of fitness. If colonies survive to the next season is not only dependent on the varroa and virus levels in the colonies, but also on other circumstances that influence the survival and how a colony thrive, for example other pathogens like nosema and quality of food like pollen throughout the season. Instead of starting the project with 5+5 colonies with each type of bees, we have choosen to start from a fewer number of hives and increase the numbers. And we plan to continue the project for at least 3-4 years. We have choosen areas for the test that are low in nectar and pollen sources. That’s also a reason why the number of hives are restricted to five in each part, which makes a total maximum for each type of bees 5+5 colonies, 5 small cell and 5 large cell. Four Carniolan colonies, all of them being sister queens from a pure bred Carnica/Carniolan stock, were divided in two groups with 30 m between the groups. These groups were placed in a deeply forested area far enough from the Elgon bees. Here it was no farm in the neighborhood, like it is where the Elgon bees are placed. One group was established on Mann Lake’s standard plastic frame, 4.95 mm cell size. The other on Anel plastic frames with 5.5 mm cell size. Frame size medium (448 x 159 m). Hive type well insulated styren plastic boxes. In 2014 half of the Carniolans got only Mann Lake’s 4.9 (SC), half got Anels 5.5 (large cell, LC). During 2014 they were this way transferred to these two types of frames. Increasing cell size in the LC-group up to 5.5 was no problem either as they were adapted to 5.5 in their genetics before they came here. All the Carnica/Carniolan colonies were treated with thymol in 2013, but not much, and in September 2014 after they were moved to their test destination. No DWV-bees were observed in 2014. In 2015 in June the LC-group (both colonies) showed 6% varroa level and crippled winged bees, one colony quite badly. They both got one treatment with two homemade thymol pads with about 5 gr thymol each. The LC-bees gave no crop. The Varroa level had not increased again very much and was only about 1 %. The SC colonies had 0.3% and 1% varroa level respectively. In beginning of June a so called walk away split was made from one of the SC-colonies. The new queen then of course mated to very closely related drones. The strongest SC-colony gave a small crop. In September the SC-colonies still had only around 1% Varroa level. None of the colonies got any treatment in the autumn due to the low varroa levels. The SC-colonies thus got no treatment at all in 2015. The weakest of thee LC colonies didn’t make it through winter. The second one looked fine in May. The weather was then rainy and chilly for several weeks, and when the beekeeper returned in late May to monitor varroa levels, in the remaining LC-colony he only found some dead brood and a few dead bees on the bottom. In spring 2016 the now three SC-colonies were doing fine, two of them though small in size. In the three SC-colonies the varroa levels were 3-4% in late May and some crippled winged bees appeared. Thymol pads were applied in June. A walk away split was made from the strongest SC-colony. The weather was unfavorable and the other three robbed the split. It thus died. In September the three SC-colonies looked fine and got no treatment. The bees superceded the three year old queen. The three SC-colonies were moved to an apiary with better resources for nectar and pollen. Some more pure bred Carnica queens were received in 2016. They will be used to biuld up the test apiaries again. Daughters will be bred from these and mated in the apiary with drones from the survivor colonies of the SC bees. The whole season of 2016 was bad in producing nectar and pollen. The colonies had a hard time growing in size. It was late in the season when complementary feeding in preparation for winter was done that they grew somewhat in strength. That was the reason these bees were moved to a better place for food. All three colonies actually were weaker than wanted going into winter. Two colonies made it through winter. The third and weakest died. This colony had probably survived if it had been fed honey (or fondant) and pollen during the worst nectar- and pollen drought periods. Six Elgon colonies of two different mother lines divided in two groups with 3 colonies each were set up. These groups were placed in a deeply forested area with a small farm in the neighbourhood. The two groups were placed about 700 meters from each other. One group got Mann Lake’s standard plastic frame with small cells (SC), 4.95 mm cell size. The other got Anel plastic frames with Large cells (LC), 5.5 mm. Two sister groups were used. One sister group consisted of 4 queens, 2 SC and 2 LC. The other sister group had two queens, 1 SC and 1 LC. Frame size is medium, (448 x 159 mm). Hive type with well insulated styren plastic boxes. The Elgon groups were established with new queens in 2014 and transfered successfully to Mann Lake’s 4.9 and with big difficulties to Anels 5.5. The queens in the LC colonies were very hesitant to lay in their large cells. One queen totally refused.The broodnest of that queen consisted of only two shallow SC-frames. The resulting colony was of course small going into winter in 2014, but it wintered together with the other two LC colonies in their test apiary. Most of the colonies, SC and LC, were treated in 2014 with thymol but mostly only in May. So this Elgon test groups of 3+3 were not managed in regard to the Varroa mites, similar to the Carnica groups. In the Carnica colonies the varroa populations were evened out between them, by treating them with home made thymol pads in September 2014. The Elgon test colonies were taken from different apiaries and the varroa level in the colonies were not known when they were brought to the test site in late August. Earlier in 2014 the colonies who had wingless bees were treated with thymol, in May that was. In spring 2015 the Elgon LC group continued to create problems as the bees protested against using LC combs for brood by supersedure their queens, probably in an adaption process. In April before grafting time and any drones were flying one LC-colony was queenless. The new virgin queen had of course failed to mate and was gone. I combined the queenless colony with the mini colony (the one with the queen that had refused to lay but in the two shallows). This queen still refused to lay in any other comb than the two shallows, so I tried to fool them by giving them a couple of 5.3 mm cell sized plastic frames on each side of the SC combs. That worked. When the 5.3 were filled on each side of the 4.9 they started on the 5.5 next to the 5.3. In late April 2015 the third (now the second as the other two were combined) LC-colony had a virgin. They were also trying to supersedure their queen. No drones available yet. So she failed. The colony got a queen cell in second half of May. That queen got laying. This colony had 5% varroa level in August and got thymol. The first colony (former first and second combined) got a small piece of thymol (actually both parts that were combined got half a piece each) early in spring to help against eventual patoghen problems as they had different kind of problems (weak but queenright and queenless). This colony showed only 0.3% Varroa level in August and got no treatment. In 2015 the three Elgon SC colonies developed well. Splits were made from two of them. One failed, but finally got a laying queen very late in season. It ended up weak. It was lost during coming winter, the only loss of the Elgons. The smallest of the overwintered colonies had a queen that was laying badly. It was killed and replaced by a ripe queencell. Four of the now five colonies showed crippled winged bees in July and had Varroa levels between 2-7%. Even the 2% colony showed a few DWV-bees telling me the virus levels in the colonies were quite high. One 3% had no DWV, the weak one mentioned above and it was the only one that didn’t get treatment. The Elgon bees had better nectar flows than the Carnica in 2015 and the Elgon colonies gave a good crop from the Heather in 2015. The average crop was about the same for both SC and LC colonies. In August none of the SC Elgons had above 3% varroa level. They had 0%-3%, and got no more thymol. No colony swarmed in any of the test apiaries. In spring 2016 one of the Elgons, the very weak one in the SC-group died (as mentioned above). Both LC colonies survived. In the LC-group splits were made from both colonies. Weather was bad and one failed to produce a laying queen. It got a new ripe queen cell. The parts with the ”old” queens (from the year before) both superseded their queens, in line with experiences in 2015. This year they waited until beginning of summer when there were drones around. Maybe the bees had adapted somewhat to LC now. The season of 2016 was very bad so no crop was secured from the LC-group. In spring the varroa levels were 0.3% in all four colonies (they became four after splitting in late May). In early September it was 0% – 8.6% – 0.9% – 4%. The two with highest levels were treated with thymol. The other two not. We can see that two colonies had very low levels of Varroa mites. This indicates a good genetic set up for Varroa resistance, also to be able to work with large cells apparently. The queens in the colonies with low Varroa level are sisters, mated in the test apiary. They are daughters to one of the colonies in the apiary, one in a split. The other as a result of supersedure in the mother colony producing this split. The four remaining colonies in the SC-group gave a split each. Season was bad and two of the splits failed. A small crop was secured from the strongest of the colonies. The two colonies with two year old queens supersedured these later in season. 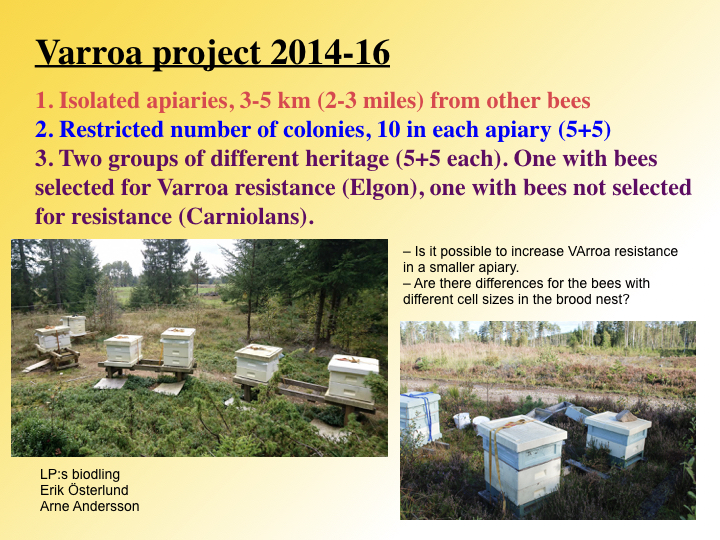 The 6 colonies all had 0.3% varroa levels in spring. In August the varroa levels were between 0-1.7%. As we had decided not to keep more than five colonies in each of the four parts of the test, colony no 6 of the SC-ones (the one with 1.7%) was removed from the test area. It wastreated with a small amount of formic acid to get an idea of the mite load and also test the shaker method. It fell 10 mites in a couple of days. 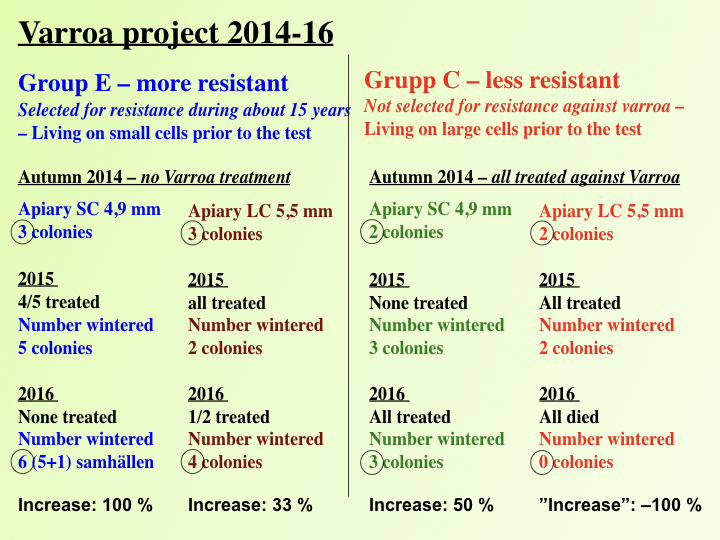 The other 5 colonies remaining at the test site didn’t get any treatment. All four colonies in the LC group wintered well, in spite of that two of them were almost too weak, those that had had the highest Varroa levels and been treated. One of the five SC colonies defecated a lot on the outside of the hive, though not much inside. They did not have a large amount of honey left for winter the previous autumn. And it was of good wintering quality. The winter before all colonies had had a large amount of difficult winter honey, from heather. The colony that died was the strongest and smallest Varroa level. It measured 0% on 400 bees. The was a good amount of food left in the hive after it had died. The colony had an old queen, and just a few meters there had been quite some traffic during late winter from a tree harvester. The other colonies looked fine, with almost no defecation. Harvest and Varroa level 2015 and 2016 in SC and LC parts of the Carnica bees. The sites for Carnica and Elgon bees are not comparable as the Carnica site was didn’t have the same amount of food sources. Click on the picture to get it bigger and of better quality. 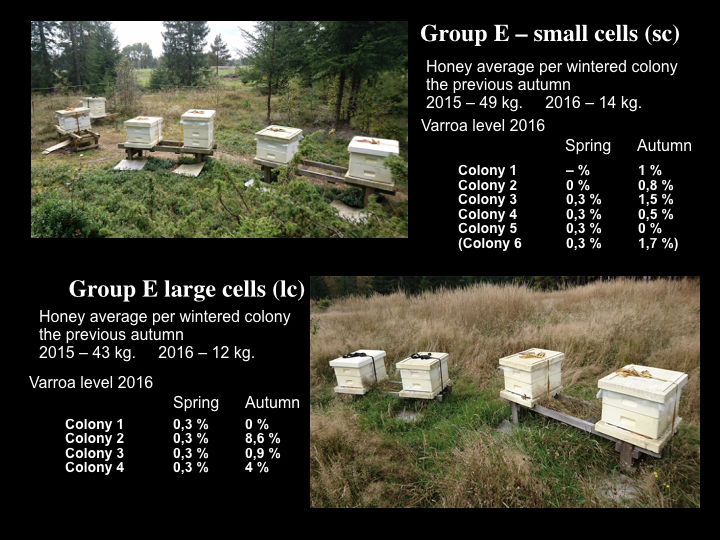 Harvest and Varroa level 2015 and 2016 in the SC and LC parts of the Elgon bees. The losses in the Elgon groups have been quite normal, on the lower side. It has in percentage been higher in the Carnica groups, especially among the LC bees. The higher amount of losses can be explained by the low availability of pollen and nectar, especially during 2016. That’s why the test site for the Carnica bees has been moved. One conclusion is that during times with small amounts of available pollen and nectar a solution could be to feed the colonies fondant/honey and pollen to develop healthier and stronger colonies better adapted to survive winter. The strategy to measure the Varroa level a couple of times during the season and use Varroa treatment (dish cloth pads, about 50 x 58 x 1.5 mm [2”x2”x1/16”], drenched in thymol) when/if the Varroa level is higher than 3 % (only treatmnent in these colonies, not in those below 3 %) has minimized reinfestation, maybe altogether. You thus get a true picture of the Varroa level in the colonies and thus a better selection of the most resistant colonies and the most susceptible ones. 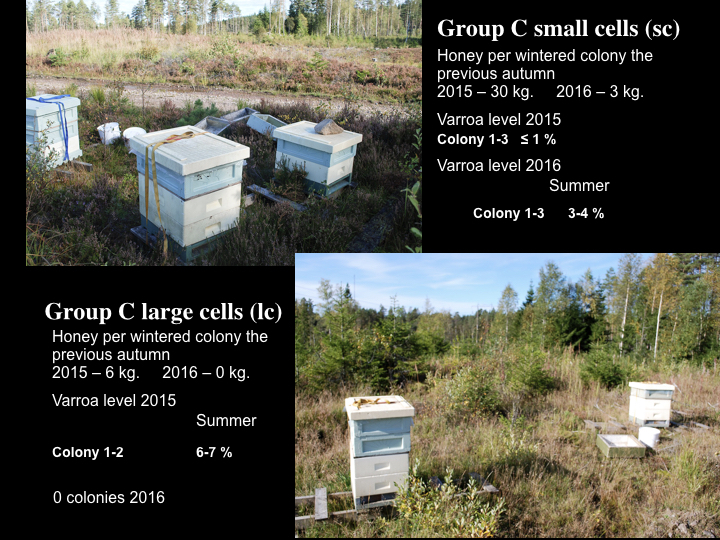 You could for example have expected that the different cell size groups had affected each other so that eventual difference in the varroa levels had evened out, especially among the Carnica bees as the two groups there were only 30 m apart. Relatively little of Varroa treatment has been used, probably partly explained by the absence of reinfestation, no silent robbing. Most treatment has been used in the LC colonies of both the Elgon (2016 when reinfestation had been removed) and Carnica (2015, in 2016 there was no LC left) colonies. The strategy of 3 % seems to have eliminated the need of Varroa treatment in the SC part of the Elgon bees due to elimination of reinfestation and enough good development of the varroa resistance with the Elgon bees. This strategy has also lessened the need for varroa treatment to every second year with the SC part of the Carnica colonies and the need for treatment then has been small. Thymol in this context has been effective. In the LC part of the Carnica bees the need for treatment has been bigger probably because of a quicker development of the Varroa population. It seems fitness has been lower here probably partly due to the bad pollen and nectar availability. But fitness may also be lower because of other reasons. The Carnica LC colony that died in May did not die due to high varroa level. Lack of protein and/or other pathogens (like nosema) can be the cause. The Carnica test site is moved to a place with better food sources. One can object to this conclusion of lower fitness for LC bees because the number of colonies are low. On the other hand were all original queens in the Carnica group sisters and all colonies in SC and LC groups (Elgon and Carnica) are behaving consistent in this respect. And any difference in fitness between the two cell size groups among the Carnica bees should have been to the advantage of the LC colonies because the SC colonies had become inbred. Usually follows a lower immune system with inbreeding. Possible impact of this small distance would have been small(-er) difference in the varroa levels between the two groups due to evening out of the varroa populations. The 3% strategy, measuring varroa levels and treatment when it was above 3%, lowered the varroa populations enough to eliminate (totally or enough) the silent robbery. In 2016 the only colonies that needed treatment were in the LC colonies of the Elgon bees. It should though be noted that with a stock of bees that have been selected for Varroa resistance it is possible to find colonies that are resistant also on large cells. Two colonies (with sisters queens) had very low levels of Varroa mites. The honey crops, the bee strength of the colonies indicates, and the resulting number of colonies in the SC and LC parts of the stocks of bees indicates that it is no disadvantage to use small cells in the broodnest, rather the contrary. Summary of production of new bee colonies, increase in the number of wintered bee colonies. These figures could be seen as a measure of the vitality of the different cell size groups. There is a difference to the benefit of SC bees both in the E group (Elgon bees) and the C group (Carnica bees). Click on the pictures to get them bigger and of better quality. Suggestion on a breeding program for increasing Varroa resistance in a bee population. The background for these suggestion is the results of this project, so far. This entry was posted in Breeding, Cellsize, Disease resistance, Elgon, Management, Varroa level, Varroa resistance and tagged alcohol wash, cellsize, varroa resistance by Erik. Bookmark the permalink. 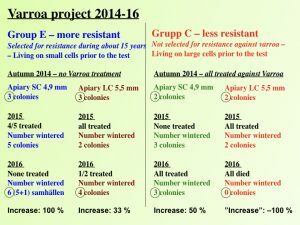 This is the first time I read about side by side comparison of bees already selected for varroa resistance vs bees that have not. Although, it would be more ideal to compare the same genetic background (which would mean Carnica already selected vs Carnica not selected for resistance or Elgon respectively), it gives further evidence, that it’s best to start with such projects with bees that contain already resistance traits. On the other hand, one can start with a high amount of bees in the first step and then do a stringent selection step, to go ahead only with bees that conatin improved resistance features. I personally learned last year that it is indeed a good idea to use a kind of threshold as selection criteria – you suggested 3% mite level – which seem to work out fine in your operation and for this experiment. If you don’t do that you risk the damage of acceptable colonies by mite spreading from bad colonies. To limit the apiary size certainly hits in the same hole. If one want to stay absolutely treatment free, one can use capped brood removal instead of treatment with thymol, which I found is working efficiently. And of course to replace queens that are inferior. My criteria here for inferior queens is I replace all queens that enrich mites in early summer (May – mid of July). If I should have enough stock for selection and I will expand this selection criteria to late summer as well, but at least all stock that does not enrich mites when bee number increase and drone brood is avaliable, has some amount of resistance traits. Another comment that I want to make is, for your last hint: “Use queens from different projects.” I think it’s worth saying that the race should be comparable. If you combine to many races, similar to what Juhani is doing, you might risk your progress. Finally, it’s nice that you provide data based on a structured experimental basis, that allows duplication and is of course much ahead compared to “anecdotal evidence”. PS: I want to make another point: You mentioned: “Treat when you see wingless bees.” My personal experience, which is supported this year again tells me, when you see wingless bees in early spring in low amounts and stock is strong enough and has resistance traits, this normally disappeared when hives become stronger and is of no longer issue. Thanks Rüdiger for your thoughtful answer. It takes some effort to read through a long report with a lot of facts. Yes, you get data that give insight into more subjects than you put up as goals for the project. It was not a goal to compare two different subpopulations/races, but to see if it is possible to select for resistance with a small population/apiary(-ies). To compare two different subpopulations you need many more colonies, for different reasons. One is the difference in locations. The apiary for the Carnica group was not as good as the one for Elgon, even if that one also was not good. So the environmental circumstances are difficult for the test, in that respect. That is one of the reasons why we don’t use removal of all capped drone twice with a week in between. It would be too big difficulties getting the colonies strong and healthy enough for winter with more winter losses. Also this is a method that most beekeepers think will involve too much work for them. But it is absolutely a choice. There is a difference in testing and using queens from different projects. I have learnt you cant use queens from different areas and operations right away producing a lot of daughters. That’s why I use the word “test”. You to begin with make a few daughters to see how they perform in different respects, mated to your drones. If someone of those are good or even better in some traits it’s probably that daughter you should use in your breeding further. Or/and also the mother. Don’t treat when you see just one wingless bee, test the varroa level first. But if you see two or more wingless bees, in front of the hive or in the hive – take action. That’s my experience. But it’s a good solution to test the varroa level then too. Thanks for sharing this, Erik! IPM ( Integrated pest managements) are very much discussed on the forums right now. What we can do is splitting, brood culling, drone culling and watching which queen is the best and breed from her, if we don´t want to use chemicals or oils. In my case I started to monitor in earnest. I open brood cells ( drones and workers) now sometimes after checking the boards ( two times now) and I made my first AMM-hybrid splits with less capped brood combs going with the queen ( I want to observe if brood brakes help). Could be I will use the shaker but I´m more interested what´s going on in the cells. My losses are high but half of them were the bad matings 2016. Even now one hive supersedes ( one year old queen still there but laying drones in worker cells and 50% drones inside). For now you might say I did the hard bond, but still, with my survivors I will have the same number of hives in autumn, I hope. But if they are mite loaded, I will do some IPM. ( One was robbed in early spring, so I will prevent robbing with robber screens). We are a small group of enthusiasts now, with beekeeper meetings once and again. We will exchange stuff among us from our survivors. As a group I believe it possible to maintain a number of small bee yards. Those with higher losses get surplus hives but, if monitoring is done in a serious way and local mutt queens with good genetics bred accordingly we together are one big beekeeper. I believe the local mutt breeding, bees that adapt to one´s special circumstances much more important now than to purchase bred “resistant” stuff, but it´s probably good to have a start with those genes. Being the curious person I am I will get an artificial swarm of treated big cell bees next months which I will place alone in my garden but not isolated from other beekeeper`s hives. This bees will have to build natural comb and will never been harvested. I want to see how they fare and how the mite situation develops. The elgon hybrids seem to do very good, they are strong and I saw opened cells with blue-eyed pupae ( VSH, if it is). I will update you via e-mail.